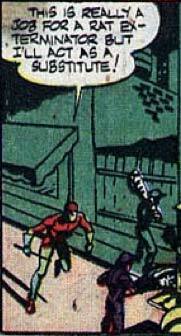 He’s sayin gthat while running towards a couple of guys and carrying a large spike/bar of some sort. WHAT exactly is the job for a rat exterminator? Is that long object a probe? Is one of those men Richard Gere? For only four easy payments of $19.95, plus shipping and handling, you too can have your very own rat exterminator substitue. But that’s not all. Act now, and we’ll throw in for you at no additional cost, this set of four artificial booby-traps, this one-of-a-kind, hand-held imaginary pair of forceps and this irridescent glass in a jar. Did we forget to mention that the jar is also made of glass? Afraid that it might be too late? Don’t be. You still have time to place your orders, but hurry because time is running out. If you call withing the next twelve hours(seventeen hours if you’re in Canada) You’ll recieve a custom color illustration of your choice drawn by famous artist Rob Liefeld. Loved the last part Frankie.